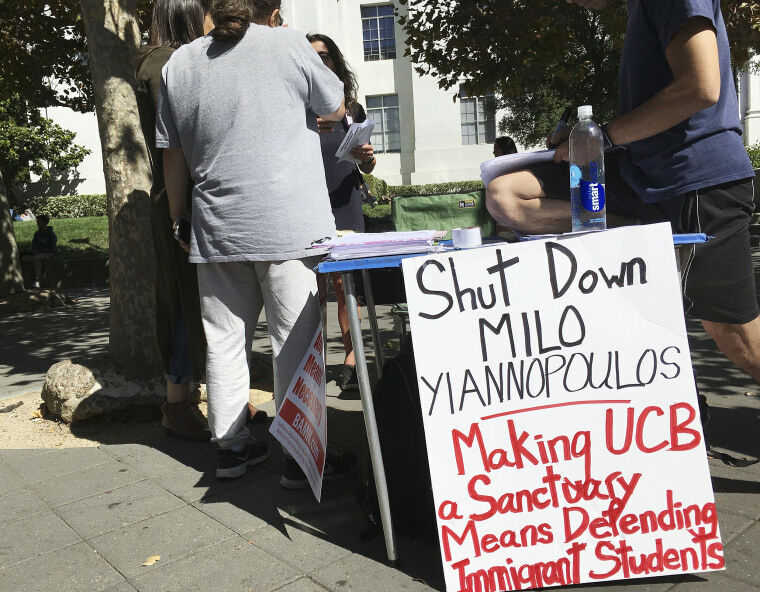 The University of California, Berkeley, announced Saturday that a conservative student group has canceled the so-called "Free Speech Week" it was organizing with right-wing provocateur Milo Yiannopoulos. The Berkeley Patriot's four-day event was set to begin Sunday and would have been "open to all political ideologies, with speakers representing conservatives, libertarians, and even liberals," the group said. Each day had a theme: feminism, Silicon Valley, Islam or higher education. "It is extremely unfortunate that this announcement was made at the last minute, even as the University was in the process of spending significant sums of money and preparing for substantial disruption of campus life in order to provide the needed security for these events," Assistant Vice Chancellor Dan Mogulof said in a statement. UC Berkeley reportedly planned to spend nearly a million dollars on security for the event. Yiannopoulos' appearance on the university's campus in February sparked riots in which attendees threw rocks, fireworks and bricks. University police fired rubber bullets and tear gas in response, and Berkeley officials estimated the school suffered $100,000 in damage. Earlier this month, UC Berkeley also hosted conservative activist Ben Shapiro. The university spent $600,000 to provide security for the event for fear of potential violence. On Saturday, Yiannopoulos held a news conference and blamed the university for the cancellation and declared that he would not be giving up — although he claimed he was "blind-sided" by the students' announcement. Nevertheless, he still planned to be on campus on Sunday and shared a picture on Instagram of his luggage. "We will not be deterred," he said. "We will proceed no matter what, in whatever format we can, to realize the promise of Free Speech Week and send a message that conservatives will not be bowed by pressure from academics, the media or anyone else." An email sent out by the self-described "troll" called for supporters to participate in a "March for Free Speech" through Berkeley's campus at noon Sunday. He promised that a few of his fellow speakers and conservative activists, such as Mike Cernovich, Lauren Southern and Lisa De Pasquale, would be in attendance. The email encouraged supporters to bring signs to the march. "It's time to reclaim free speech at UC Berkeley and send shockwaves through the American education system to every other college under liberal tyranny," the email said. At his news conference, Yiannopoulos — with Cernovich and anti-Islamist activist Pamela Geller sitting at his side — continued to place the blame squarely at the feet of the UC Berkeley administration. He reiterated the plan for a march on Sunday, adding that he could not ensure anyone's safety. Yiannopoulos also said he would give $10,000 to the Berkeley Patriot and promised to reimburse any travel expenses individuals had lost attempting to attend Free Speech Week. "Though I'm a little cross with them, I am nonetheless going to be endowing the Berkeley Patriot with $10,000," he said. "It is my view that Berkeley needs a strong, conservative, free speech publication." The student group claimed that the UC Berkeley administration threatened to investigate the group for hate speech after Berkeley Patriot members filed a complaint with the Department of Justice. "Baseless and unconstitutional charges of 'hate speech' and other odious campus rules violations have been leveled against our members, coupled with threats to conduct 'investigations,'" Berkeley Patriot member Mike Wright wrote in a statement. UC Berkeley maintains that the Berkeley Patriot missed a number of contract deadlines and did not confirm the venues with the university, which the student group denies. The university also shined a light on the confusion and obfuscation around the rally's planned lineup, as reports grew about speakers abandoning the event or stating that they had never planned to attend in the first place. Free Speech Week had previously boasted former chief White House political strategist Steve Bannon and Anne Coulter as members of the lineup, but their names mysteriously disappeared from the website without explanation. According to The Associated Press, Coulter acknowledged that members of Yiannopoulos' team had contacted her, but she had decided not to attend.